LotsaLoot Classic Slot Guide & Review - Casino Answers! LotsaLoot is a 3-reel, 5-line classic slot machine developed by Microgaming, featuring a wild symbol, multipliers and a progressive jackpot. You can play the LotsaLoot 3-reel progressive jackpot slot machine at Bovada. The coin value on the LotsALoot slot machine is fixed at $0.50. You can play 1-5 coins per spin, which corresponds to the number of lines you play. Casino Answers recommends that you always play the 5-coin maximum bet on the LotsALoot 3-reel progressive jackpot slot to be eligible for the progressive jackpot. You can bet as little as $0.50 on the LotsALoot slot game up to the maximum bet of $2.50 per spin. To play LotsALoot, select your bet with the “Bet One” button and hit the Spin button or you can simply hit the “Bet Max” button to play with the maximum bet. To win the LotsALoot progressive jackpot, you must hit 3 LotsALoot symbols on the fifth payline. In order to enable the fifth payline, you must play the 5-coin maximum bet on LotsALoot. At the present time, the LotsALoot progressive jackpot is at $31,044 and rising at a rapid and steady pace. The LotsALoot symbol is wild and when it substitutes in winning combinations, it will multiply your winnings by 2X! You can win the LotsALoot progressive jackpot by signing up and making a deposit at Bovada! There are 6 winning combinations on the LotsALoot classic slot machine. The complete payout schedule is as follows (line 1/2/3/4/5 payouts in parenthesis when applicable): any 3 Bar symbols (4), 3 Single Bar symbols (10), 3 Double Bar symbols (40), 3 Triple Bar symbols (60), 3 Seven symbols (80), 3 LotsALoot symbols (1000/1500/2000/2500/jackpot). To use LotsALoot’s autoplay mode, hit “Expert” and you can play 5 or 10 autoplay spins or hit the “Auto Play” button to open up advanced settings. You can set the number of spins (5, 10, 25, 50, 100, 250 and 500), number of seconds between spins (0, 0.25, 0.50, 0.80 and 1.50), stop once all spins are complete, stop when jackpot is won, stop if a win exceeds or equals ($25, $50, $100, $250, $500, $1000 and $2500), stop on any win and stop if credits increase/decrease by ($25, $50, $100, $250, $500, $1000 and $2500). You can stop autoplay at any time. 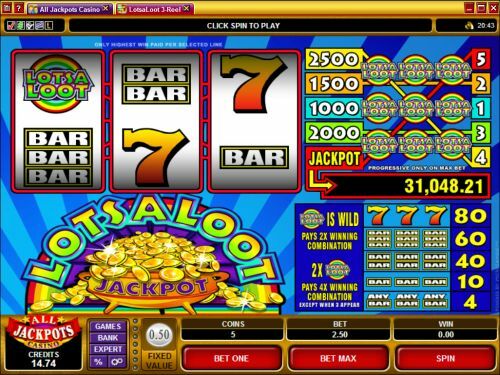 LotsALoot is a great classic slot to play if you’re looking to win lots of loot. It’s inexpensive and has a huge progressive jackpot for a classic slot game. You can play LotsALoot at any Microgaming casino, including Bovada. Can players from within the United States play the LotsALoot progressive slot? Unfortunately, American players cannot play the LotsALoot online slot machine. For a great selection of progressive jackpot slots USA players can play, you can sign up at Bovada Casino or read our Bodog Casino Review. Can I play the LotsALoot progressive slot game for free? Unfortunately, Microgaming does not allow players to try their progressive jackpot slots out in practice mode. For online casinos where you can play their progressive slot machines for free, please check out Bovada. I got 3 LotsALoot symbols. How come I didn’t win the progressive jackpot? To win the LotsALoot progressive jackpot, you have to hit all 3 symbols on the fifth payline (from bottom left to top right). You must play the maximum bet to enable the fifth payline on the LotsALoot classic slot machine.